Sewing for my tiniest girl is easy, because thus far she’s never refused to wear anything I made for her, and because toddler clothes are all cute. 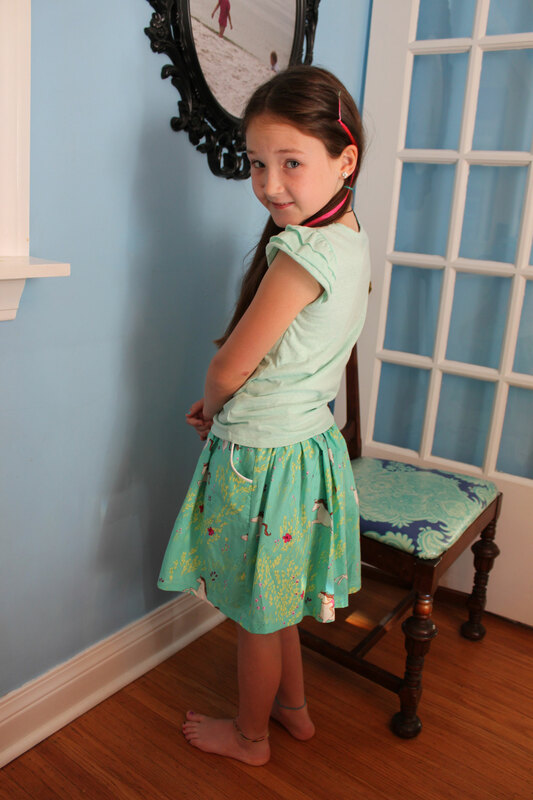 Sewing for my tween is a little trickier. In addition to taking into account her numerous preferences I feel pressure to sew things for her that are appropriate to her specific age, which is in itself a tricky thing. She’s tween in truth–neither a child (though often childish) nor a full-fledged teenager (though she often acts like that too). She’s big and little, she’s responsible and flighty, she’s wise and naive, she’s precious and difficult, she wears pigtails and ratty friendship anklets until they fray and fall off. She’s into horses, so when I saw the Michael Miller Wee Wander Summer Ride fabric I thought of her. If you zoom in on the fabric you can see that it has an image of a girl with long, dark hair riding bare-backed, fast and free. 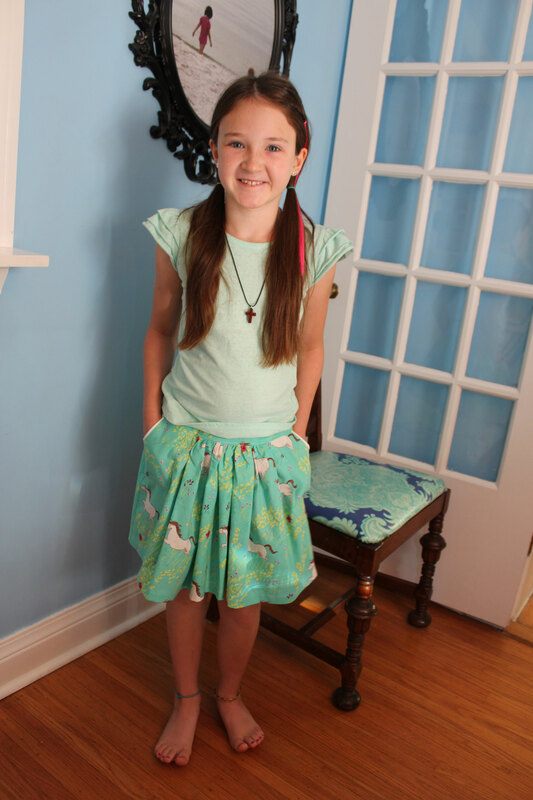 It’s the perfect tween fantasy fabric–sweet and feminine, but with a strong, independent subject. Once I had the fabric in my stash and a girl who felt excited about it, I wasn’t sure what to do next. After some searching, I found this tutorial online for a piped-pocket skirt. Again, it’s a good tween pattern. It is twirly and fun, but it has sophisticated little piped pockets. Perfect! My daughter wears the same size as the model child in the tutorial, so I followed her instructions almost exactly. It’s in centimeters, so I had to drag out a tape to convert everything to inches, because none of my cutting rules show metric measurements! But it came together nicely, and most importantly, Dorothy loves it. She decided her pink hair extension coordinated with it better than any of her other hair extension color options. Who am I to say it doesn’t?